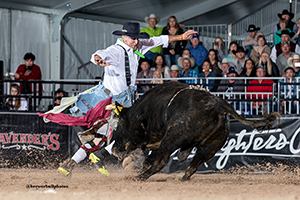 LAS VEGAS – Weston Rutkowski is the bullfighters’ version of a Masked Avenger. 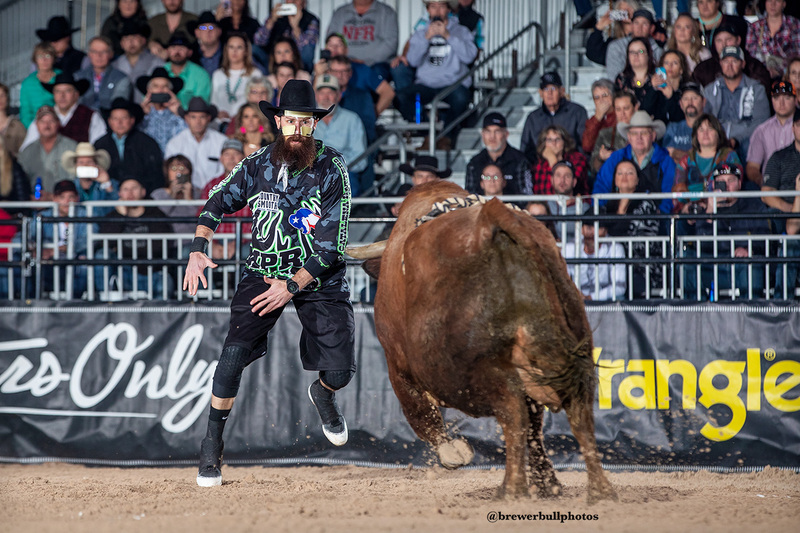 After taking a shot during last week’s Roughy Cup to start the Bullfighters Only Las Vegas Championship, the Texan suffered three facial fractures. Instead of bowing out and sitting on the injured reserve, Rutkowski worked with the Fit N Wise Sports Medicine team to come up with a solution that will allow him to compete. On Monday afternoon, he tied for the highest score in Pool A’s first Flexfit Preliminary Round with fellow veteran Ross Hill. Both men scored 84 points, which will go a long way toward advancing to the Hooey Championship Round Saturday. “This is just adversity, but any kid that wants to be a world champion in anything knows it comes with a price,” said Rutkowski, the two-time reigning world champion from Haskell, Texas. “If you’re not willing to go past something that pushes you mentally and physically, you’ll never be able to be at the top of any sport. Monday featured Pool A in the opening day of the preliminaries. They will return to fight their second bulls on Wednesday. The nine men in Pool B will kick off their round at 2 p.m. Tuesday. The top two-fight aggregate scores will advance to the final day of the year. The others will move on to Friday’s Wild Card Round. “Today, I was 84 points, but I should have been 90,” said Hill of Muscle Shoals, Ala. “I let that bull get ahold of me and put some horns on me. However, I’m good to go and healthy. I’m ready for Wednesday. I’m not going to worry about where I am in the aggregate, because that could change with the guys in my round. It’s 100 percent talent at this bullfight. That’s the case in any man vs. beast competition, but it’s especially true in bullfighting. The men in the game can’t worry about the others; if they do, their focus isn’t on the animal where it should be, and that could be a dangerous situation in a hurry. This is just the next step in the race for the BFO world championship. Rutkowski is the only man in the game to have ever won that title, and he’s done it twice. He’s looking for the trifecta this week.